I hope everyone is having a restful Memorial Day weekend. 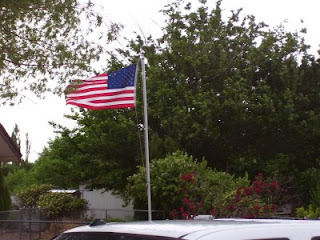 This is a picture of our neighbor's majestic flag waving in the breeze. Isn't it beautiful! I'm so thankful for the men and women that bravely serve our country. We wouldn't have the freedoms we do without them! Happy Memorial Day to you and your family!! Great pic of the flag!!!! Congratulations on your 23rd Wedding Anniversary. He is a lucky GUY!